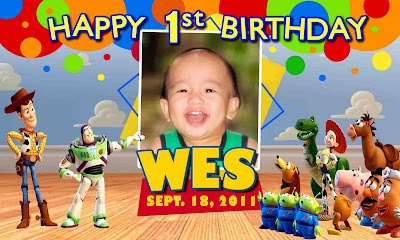 It was a perfect sunny day when we all woke up to a celebratory mood last Septemeber 18, WES' 1st birthday! To start off the day right, we had breakfast at Jollibee where he ate a lot, and made cute faces to the neighboring tables. He ate macaroni soup with rice. I had to cut his meal short because he wouldn't stop. We heard mass right after and had a private special blessing with the priest. We went home and surprisingly, I only had an hour and a half to prepare for his party. But I was confident that I've prepared everything well so no need for the rush. I would like to share this blog post to all the moms out there who are also preparing for their child's birthday celebration. First of, venue hunting. My consideration in looking for a venue are the following: availability on desired date and time, accessibility to invitees, parking space, large party area, play area, package cost and package inclusions. I went to other establishments within the area of E.Rodriguez and Tomas Morato but it was McDonald's who met all my requirements. My husband and I previously considered renting a venue and hiring a caterer, but for practicality reasons, we opted to choose a place that offers an almost complete birthday package. 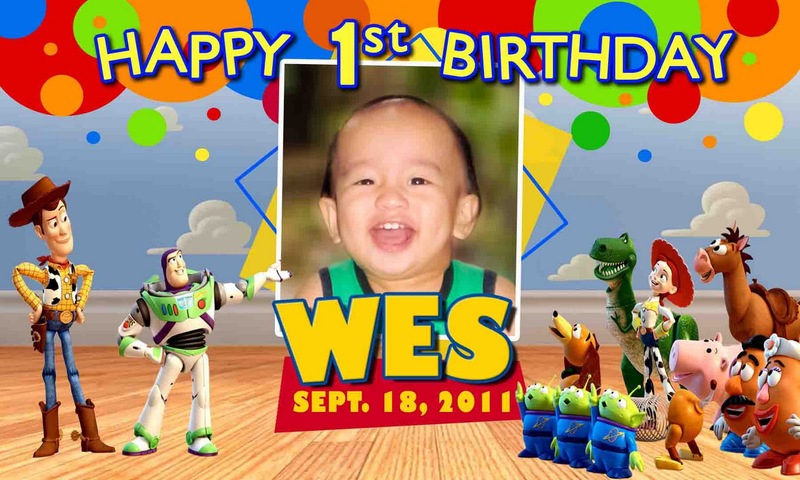 McDonald's offered 2 birthday themes at that time: Mickey Mouse Clubhouse and Toy Story. We chose the latter. The invitation and birthday banner were designed by my husband. The invites were printed on a photo paper care of Digiprint. Although McDonald's package included loot bags, I wanted to add some more fun in the goodies that the kids would take home. If I was still a kid coming from a birthday party, I would jump for joy if 1) I enjoyed the party's games and food and 2) I took home a pretty neat loot bag. 2 weeks before the party, I already purchased from Divilandia (aka Divisoria) some Toy Story stuff. I bought the following: Toy Story themed non-woven fabric loot bag, tattoo sheet, tumbler and colored pen. Inserted from McDonald's were: Toy Story pouch, notepad and sticker. Lastly, the Toy Story themed party wouldn't be complete without the celebrator himself, Deangelo Wes Liam, dressed as Woody, the main character from the movie. I ordered his costume online through Book Closet (you can find them through sulit.com.ph) and luckily I had a smooth on line transaction. The first family (that's us of course) also dressed as Cowboys and Cowgirls. I originally wanted to dress up as Barbie in the film, but my husband didn't want to be Ken (who wore really short shorts, a scarf and an buttoned down polo shirt). Woody's (aka WES) Westernized family. Yi-hah! Thank u Mommy Louise..My daughter Viannca will celebrate her 1st bday on aug 13..
Hi Mommy Louise, I also want that Movie ticket inspired invitation, how were you able to do that? Thank you woderful Mommy it really helps me alot especially now that my budget is really tight. hahaha thank you so much!